Composite of the Earth as viewed using space-based satellite data (NASA Blue Marble) with carbon dioxide concentration in the atmosphere as measured from the NOAA ESRL Mauna Loa, Hawaii site. Current 2014 CO2 concentration is about 400 ppm. Course History This course was taught for the 1st time in Fall 2012 at UNC Charlotte to 26 students. In Fall 2013, 28 students completed the course. In Fall 2014, 50 students registered. It is an elective for the Meteorology and Environmental Studies majors, and is a required course in the Earth and Environmental Sciences major. 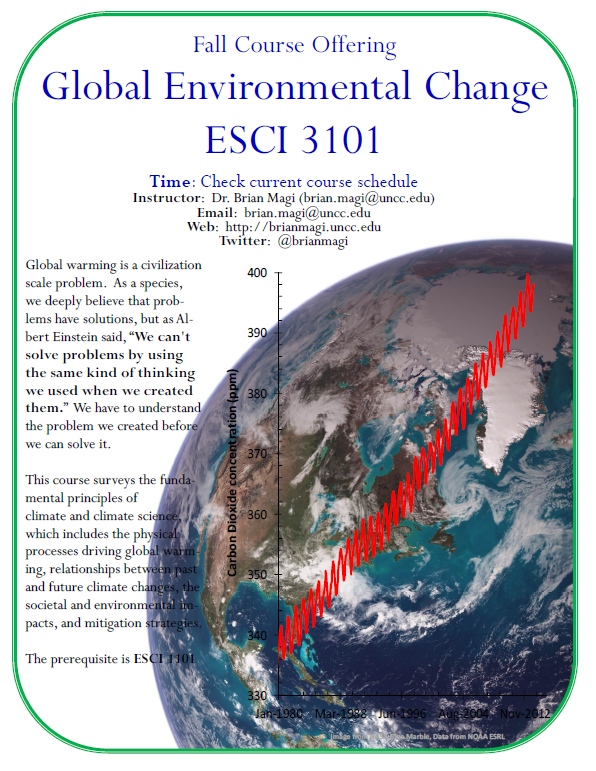 Students majoring in Geology and in Geography, among others, also take ESCI 3101 as an elective. The required prerequisite is ESCI 1101 Physical Geography. We will focus on concepts and issues related to climate science. As a powerful show once sang, “We are all earthlings spinning around together, on a planet of the sun.” Time to learn about how amazing this planet is and how we are all connected. Course Description Global warming refers to the increase in global surface temperature that scientists have concluded is mainly attributable to human activities. Global warming, however, is a narrow part of the broader concept of global environmental change. Namely, scientists from around the world have shown that a warming planet disrupts nearly every aspect of the Earth system. Human systems, such as cities, water and food supplies, and geopolitical stability, are not exempt from this disruption. If left unchecked, the implications of the on-going climate change, which is induced mainly by human activities, are staggering. Human activities are the main reason for present-day climate change, so the scientific evidence suggests that humanity has created a global problem. As a species, we deeply believe that problems have solutions, but as Albert Einstein said, “We can’t solve problems by using the same kind of thinking we used when we created them.” In this course, we discuss climate change science, the societal and environmental impacts, and mitigation strategies. We have to understand the problem we created before we can solve it. Our objectives are (1.) Develop an understanding of the processes on Earth that affect the climate from a systems perspective, (2.) Be able to describe the importance of greenhouse gases, (3.) Synthesize the physical aspects of climate science with concepts related to adaptation and mitigation, and (4.) Hone critical thinking skills through observations and problem solving. We will achieve the objectives via a combination of lecture, in-class activities, problem solving, and exams. Many different mediums for information about climate science will be employed – textbook, articles, blogs, videos, interactive data analysis via the web, data analysis by hand, and visualization methods for complex and evolving data. Some math – algebra – will be used to illustrate the quantitative information behind some of the multimedia. The major subtopics that we cover are (1.) The climate system, (2.) Evidence of a changing climate, (3.) Causes of past and present climate change, (4.) Impacts of global warming, and (5.) Adaptation to climate change, and strategies for mitigating the amount of climate change humans are causing. The IPCC Fourth Assessment Report* (AR4) and Fifth Assessment Report (AR5) are the best places to find peer-reviewed science papers. Each Assessment Report is comprised of three Working Group reports. There are reports written by AR4 Working Group I (Physical Science), AR4 WGII (Adaptation and Vulnerability), AR4 WGIII (Mitigation of Climate Change), as well as the most recent reports by AR5 WGI, AR5 WGII, and AR5 WGIII. One prominent mitigation strategy is the concept of stabilization wedges, which incrementally ratchet down our carbon emissions using current technology so that new technology can be developed to minimize carbon emissions. Direct links to review papers include air quality and climate, geoengineering, irreversibility, and sea level rise. All of these papers are very readable and not overwhelmingly technical. What are the IPCC reports? The IPCC AR4 and AR5 are literature syntheses of current (through about 2005 for AR4 and 2011 for AR5) climate science written by expert climate scientists from around the world. There is no more comprehensive resource for understanding the state of the science. Each Assessment Report is over 3000 pages (each WG report is about 1000 pages), but the Summary for Policy Makers for each WG (SPMI, SPMII, SPMIII) are much faster reads and cover the many of the critical points.